Swing Fashion - Ladies Shoes - Swing It! One of the most common questions I get is, “What shoes should I wear?” Some dances have specific shoes that must be worn but, really, Lindy Hop isn’t one of them. Sure there’s certain kinds of shoes that a lot of people wear but we really don’t have one shoe that’s THE shoe in Swing dancing. If there was one though, if Follow’s had one shoe that could be referred to as the “shoe of choice” it would have to be Keds. 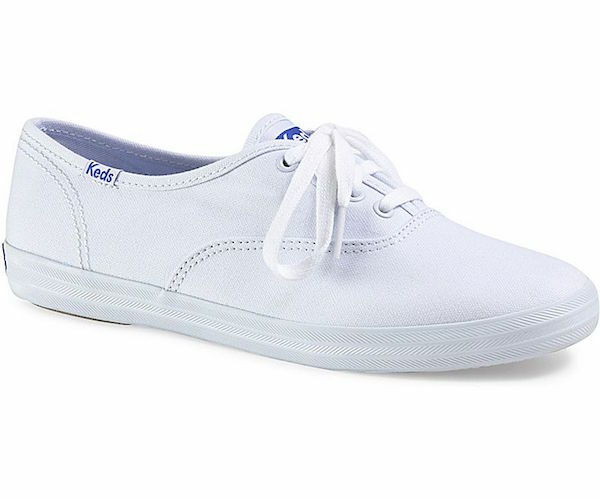 Why Keds? I’d have to guess a combination of things. First and foremost it was the style of sneaker many Swing dancers wore back in the day. It was THE sneaker at the time so that became the shoe of choice back then. Secondly, it’s a fantastic shoe. They’re light, very affordable, easily paired with any number of outfits and they have a great dance sole (if you find the right one). There’s been variations (and I’m sure there’ll continue to be). There was the sole with the classic “spin spot” (BRING BACK THE SPIN SPOT), then there was the sole with the felt strip on the ball of the foot and, in this shot, the felt strips offset from the ball of the foot. Either way, after a few solid dances the felt is gone and you’re on your way to smoothing out that sole to dance perfection. This is also why I’m not a fan of putting tape on shoes. Wear that sole down and get it just right. It’s more dependable than tape and you’re not getting sticky gunk on your sole that picks up all manner of things from the floor. There’s great stories of the Follows turning up to ballrooms in their heels but quickly changing out of them when the “real” dancing kicked off. Keds were great for Jam Circles and fast, powerful dancing. A classic, neutral shoe that’s great for dancing and good for your body. When it comes to buying Keds you’ll find a host of stores that stock them but, if you know your size, try online or Ebay for a cheaper deal (especially if you’re in Australia). You can look at any number of Whitey’s Lindy Hopper photos and clips and see an array of shoe choices. Sneakers, small heels, flats… Obviously different occasions called for different shoe choices. Either way, these days there’s Follows who LOVE their heels. You can of course track down actual vintage shoes but a great store with a lot of good choice is Remix Shoes in LA. They’re not cheap…at all…but there’s a lot of Follows in the world that swear by them and they certainly look snazzy. When it comes to heels there’s the ongoing argument about whether or not they’re actually good for you to Swing dance in. I think many physios would straight up tell you they’re not, but that’s not stopping many people. End of the day, you need to be safe and listen to your body. It’s not worth injuring yourself over a pair of nice shoes but if you can dance well in them (and balanced) and you remain injury free then rock on.